Yes, you read that title correctly. No, I’m not confusing the capital city of Laos with the capital city of France. 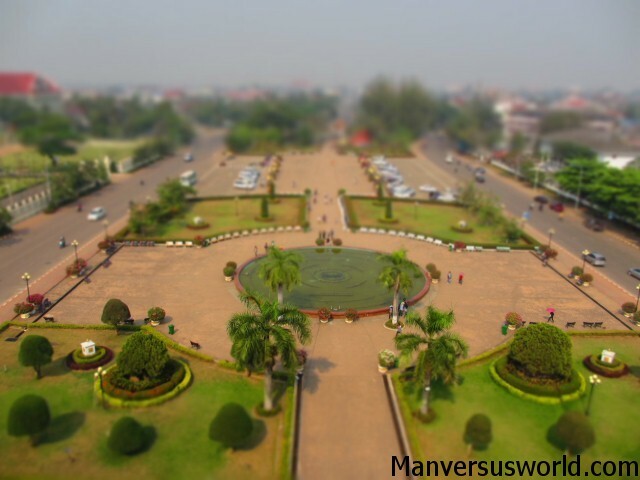 Vientiane has its own large arching war memorial called Patuxai – meaning “Victory Gate” or “Gate of Triumph” if Wikipedia is to be believed – and it’s strikingly similar to the iconic Arc de Triomphe in Paris. You can’t help but compare Patuxai (sometimes translated as Patuxay, Patousai or Patusai) to its Parisian doppelganger. Besides the towers on top and the fact that it boasts four archways instead of two, they could be long-lost cousins. Built between 1957 and 1968, the Patuxai monument was, rather fittingly, erected in honour of those who fought in the Laotian struggle for independence from France. 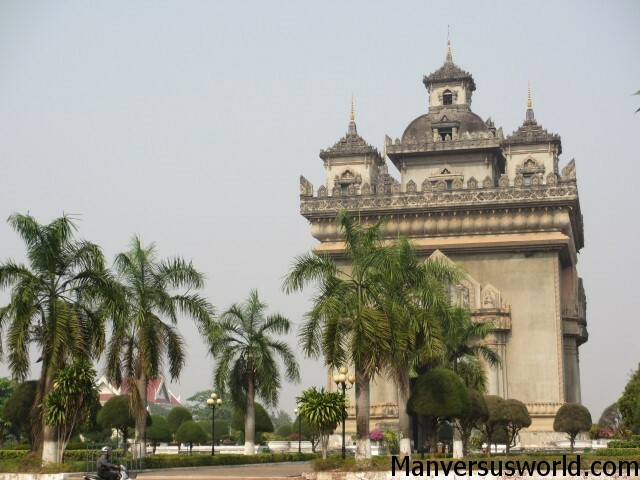 It stands at roughly 49.5m (165ft) high, which is positively huge in a city as relatively flat as Vientiane. It was constructed with cement donated by the United States Government for the construction of a new airport in Vientiane. As a result, it’s earned the rather humorous nickname: “the vertical runway”. This being Laos, entry to the monument costs less than $1 and inside the monument is more than two floors filled with stalls selling souvenirs. If that’s not enough to tip you off that you’re travelling in Southeast Asia and not Europe, the oppressive heat will remind you as you climb to the top. It’s worth enduring, though, as the view from the top is a wonder to behold. Although it’s not as good as the one in Paris (no Eiffel Tower), the palm-tree lined park and streets below are impressive from the very top. You’ll find the Laotian Arc de Triomphe of Vientiane at Th Lan Xang, within relative walking distance of the central city (if you’re keen or it’s not too hot out); don’t pay more than a couple of dollars for a tuk-tuk. Check out my guide to tubing in Vang Vieng and my ode to the best cafe in Laos – Joma. That looks beautiful. Hope I get there soon. Really need another vacation from my work and travel. I hear ya, mate – I wish I was back there right now! 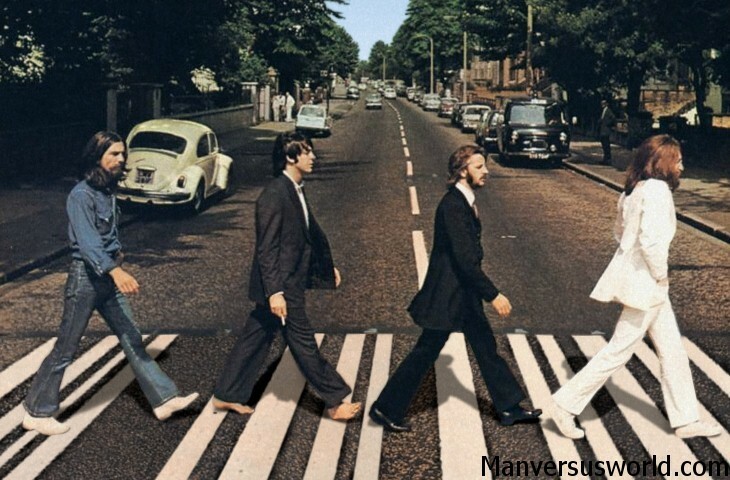 Hello, SImon, great travels and posts! One more L”Arc de Triomphe and exact replica of the French one stands tall in the middle of Bucharest, Romania.. Best regards from nomad to a traveler. That’s good to know! Happy travels! Just thought I would drop in and say hello! How are you guys doing? Nic looks really cute in the photo! Hey Gemma! Long time no see! Well, besides this there really isn’t anything exciting to do in Vientiane. Hope you guys are well – say hi to Miles for us and we’ll be sure to check out your blog! With only a day planned for visiting Vientiane, this sounds like a decent way to spend our afternoon. Thanks mate! No problem! 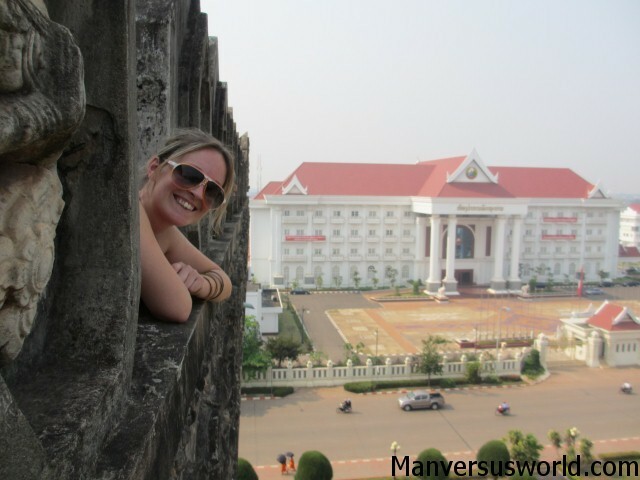 Besides eating at a BBQ restaurant on the street, I don’t know if there is much else to do in Vientiane!